I’ve been uncovering further stories that ended in conviction with Blantyre people breaking in and living in other people’s homes. Of course I’m referring to the terrible housing shortage in Blantyre that existed from right through the first half of the 20th Century. By the late 1930’s and early 40’s it had become such a sad state of affairs, that stories in newspapers of the housing shortage and the lengths people went to accommodate themselves had become quite common. 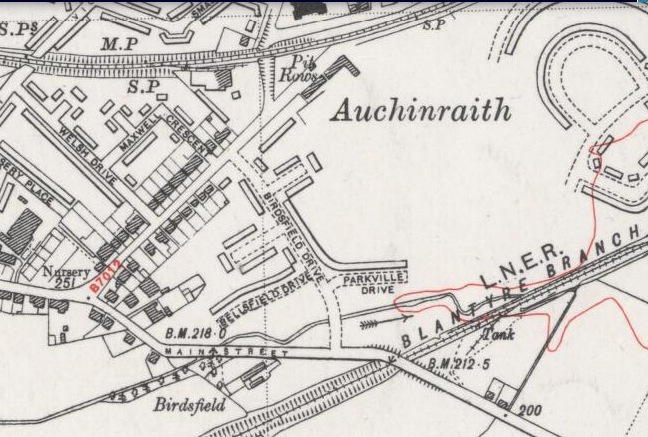 This small story relates to 1939 and in particular to the construction of the Timber Houses at Auchinraith, affectionately and locally known as Timbertown today. Four men appeared in Hamilton Sheriff Court accused of breaking into and entering one of the 68 houses under constructed at the Auchinraith site, belonging to Lanark County Council. Shortly after midnight on 30th June, a watchman guard for the site saw four men entering one of the houses on Auchinraith Road using a key. Later two of the men came out of the house, and calmly entered another. The four men stayed in the houses until the Friday night, by which time the Police had been called by the watchman. The Police took the men into custody and it was found that the men had brought blankets and chairs with them. The men were all married and stressed their need for immediate housing. A solicitor acting on behalf of one of the accused, stated their protest was aimed directly at the Council to highlight the needs for more Blantyre homes. Not one of these men or their families had homes since they had got married, spending their time with relatives as boarded tennants. The men accepted what they had done was unlawful and were fined 10 shillings or 5 days imprisonment each.